Galganov's Easy Recipe for Great for Crepes (French Pancakes)! Flip and cook the other side ... browning only one side of the crepe, lightly, if filling the crepe before serving. Brown both sides lightly if serving plain (or sugared). Crepes are served hot. Fill them, roll them up, fry them lightly and serve them. Serve them with a little maple syrup or powdered sugar ... or any way you like ... even topped with a little ice cream can make them a wonderful, little dessert! Crepes (crépes in French) also known as "French pancakes" are simply thin pancakes. They can be used in many ways - as a shell for blintzes (belinis) or as wrapping for croquettes (breaded Polish blintzes - pronounced "croquetteh"), as a desert or even, the way we like it, as an elegant breakfast dish. Of course, there is the most famous of those variations, the "crépes Suzette" - a delightful crepe, fired in alcohol ... based on orange - usually containing some Grand Marnier and a bit of orange zest. We're pleased to feature a series of short recipes designed, primarily, to be used as fillings and/or garnishes for crepes. While crepes support all sorts of wonderful flavour options such as jams (rolled in) or being rolled in sugar and cinammon we prefer fresh fruits and berries and mushrooms and other wonderful foods. 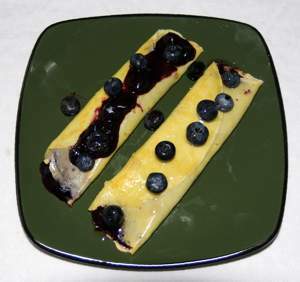 Use this recipe to make Blintzes! Prefer a less eggy crepe? Try our alternate crepe recipe. Prefer a basic griddle cakes? Click Here! When you're done here, you can always go get some Wallpaper Originals' Free Food Desktop Wallpapers for Mac & PC - now that you've found the web's best and easiest Crépes Recipe.